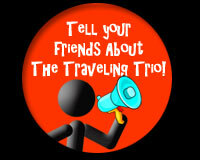 The Traveling Trio is a new TV show for kids who love to learn about this great big world we live in. Come along with Olivia, Ingram and Everett as they visit countries that you may have never even heard of. When you're done watching this show, you'll not only know how to say the name of the country but how to say some words in the local language. You'll learn where in the world each place is and all about the cool things to see there. You may even learn some history...and LIKE it! Olivia, Ingram and Everett are siblings. Olivia is twelve years old. Ingram and Everett are ten. They live in the Hill Country west of Austin, Texas and really spend just about all of their free time exploring exotic lands. Olivia, Ingram and Everett believe that the best way to take care of the world we live in is to learn as much about it as we possibly can. They love art, music, nature, animals, foreign languages, culture and history. They've lived abroad and spend summers in foreign countries where they enjoy exploring, learning and making new friends. Watch an interview with the Trio as they discuss travel and world peace.